This official and fully licensed Disney Mickey Mouse Oh Boy! Personalised Mug is perfect for any dedicated Disney fan. 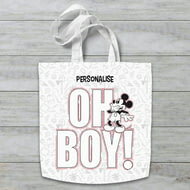 This personalised Disney Mickey Mouse Oh Boy! Tote Bag makes the perfect treat for yourself or gift for any occasion.